In one simple step, you’re able to bulk remove student blogs from My Class. This is handy when you want to quickly remove students from your My Class at the end of the school year but want to leave the blogs online so the students can continue to use their blogs or be attached to a new Class blog. Please refer to the delete student blogs support page if you are using My Class and want to delete your student blogs. 1. Go to My Class > Student Blogs in your class blog. 2. Select the check boxes next to the blogs you want to remove. 3. Select ‘Remove from class’ from the ‘Choose action’ drop-down menu. 5. This will remove these blogs from your Student Blogs page and removes you as a user from the student blogs. 6. After removing the student blogs, you will want to go to Users > All Users and remove the student users from your blog’s user list. 1. 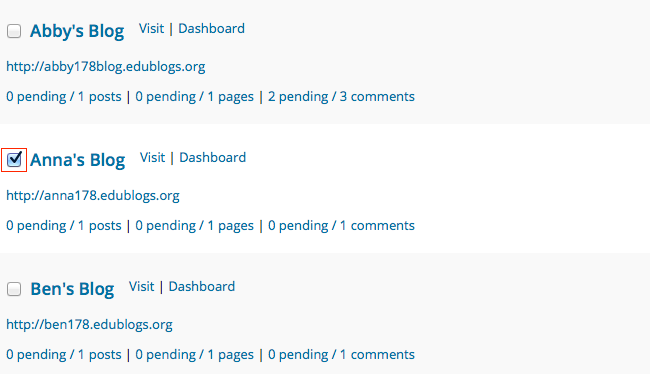 Login into your blog dashboard. 2. Go to My Class > Join a Class. 3. Search for your class blog. 4. Click Send a request to join.